Making homemade yogurt for you and your family is fun, easy and can save you a lot of money in the long run homemade yogurt. Yogurt making at home does not require any specialized equipment. People have been making how to make homemade yogurt for centuries and I start out to learn how they do it. Everything you need for homemade yogurt is probably already in your kitchen. Yogurt would come out too thin, or too tangy, or not all. After a bit of trial an error, I finally come up with a technique that works every time. This is by no means the only way to make homemade yogurt but it is the way that I do it, and if you follow the instructions it will work for you too. A total of about 7 hours and 25 minutes required to make homemade yogurt. 25 minutes prep time, and 7 hours for incubation depending on tartness preference. The yield for this recipe is 1 half gallon of yogurt. Create a double boiler using the two stock pots and bring the milk to 185°F, stirring to avoid a skin forming. Cool the milk to 110°F using a cold water bath. 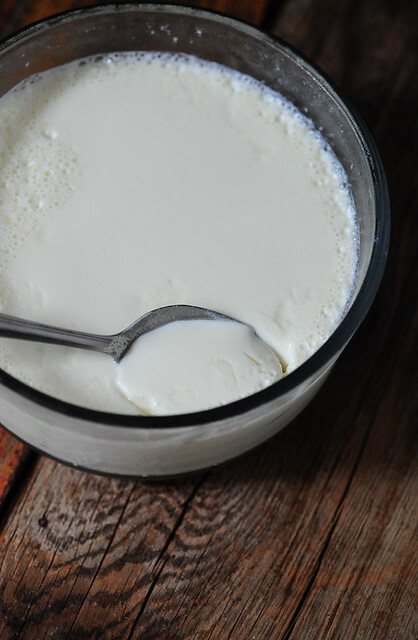 Pour 2-3 Table spoon of plain yogurt into 110°F milk and stir well. Cover and place on a heating pad undisturbed for 7 hours. Remove pot from heating pad and stir well. Thermo-philic yogurt requires a 2-hour cooling-off period to help ease the transition between culturing temperature and refrigerator temperature. Finished yogurt should be refrigerated for at least 6 hours to halt the culturing process. Once the fermentation has been stopped, it will not restart even if the milk is brought back to room temperature. If you preferred a thicker yogurt, drain whey from the finished yogurt for thickening. Draining whey produces thick Greek-style yogurt.